Here a quick guide on how to make the real Limoncello, the amazing Italian lemon liqueur. We learned this recipe after a trip in the South of Italy, in fact this liqueur is mainly produced around the Amalfi Coast and the Sorrento Peninsula. In this warm and sunny area, these fruits grow with an attractive yellow skin, very fragrant and with a particularly juicy and acidic flesh. You can buy them in each corner or market of the Neapolitan region. “Nonna Maria”, Emanuele’s Grandma, helped us with the research of all the ingredients and taught us the simple secrets to follow to give you the best fragrancy as possible. Limoncello is a masterpiece for Italians after dinner, a shot in good company around a family table or with friends help to digest as well to give a twist to your conversation. 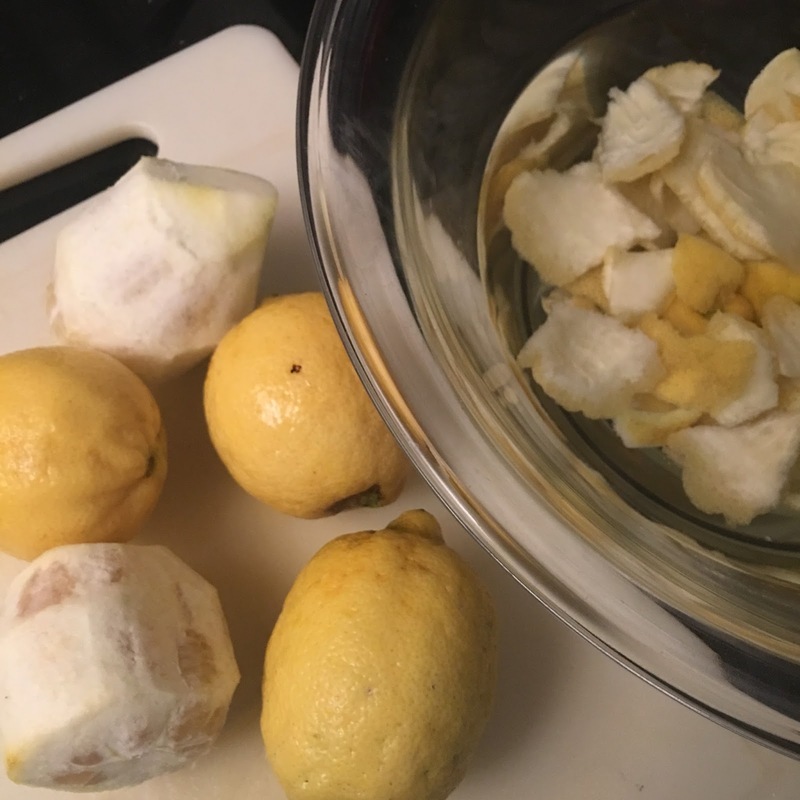 The most important thing to obtain the best homemade Limoncello is using raw lemons, the peel must be untreated so make sure to buy these in organic markets to have the most flavored zest. – Divide pulp from lemon peel using a sharp knife, leave the juicy body apart and place the white and yellow skin in the pure grain alcohol. Do not waste pulp but reinvent it for many other recipes using juice, such as a lemon cheesecake or if you are in a rush squeeze it adding sugar and water for a refreshing lemonade, kids will love it. – Let lemon rind macerate into spirit for 8/10 days in a glass jar and hide it in a dark kitchen cabinet, just stir the moisture once a day trying to resist the temptation of opening your jar. Be aware that if the container is not hermetically sealed the alcohol could evaporate and the Limoncello will result less strong and tasty. Each passing day you could notice that lemon peel will be lighter, almost white, instead the spirit dye yellow absorbing the natural pigments from the fruit. – When maceration is completed release the jar and be ready for the second part of our recipe. Get ready for risk, this process could be a little alcoholic and if you sniff too much you could get high because of the evaporation of alcohol. Bring to boil water in a pot and let sugar dissolve, then switch off the fire and pour the lemon peel from the jar in the pot in order to loose all the remaining flavor and color. – Once water is cold remove the peel, add the flavored spirit and mix, remember be careful not to sneeze too much and bring kids out of the kitchen. You will obtain almost 2 liters and a half of Limoncello, now it is time to bottle up! We know the temptation to try it immediately will be extreme but unfortunately you have to wait 30 days before drinking in order to have the best taste as possible. If you ever made an homemade flavored spirit don’t forget to share with us in comments! We are always ready to try new recipes!